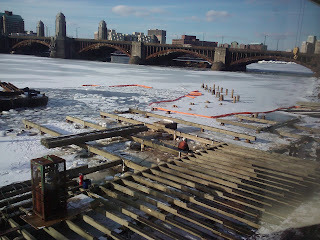 Community Boating Inc. Executive Director's Blog: Dock Progress! 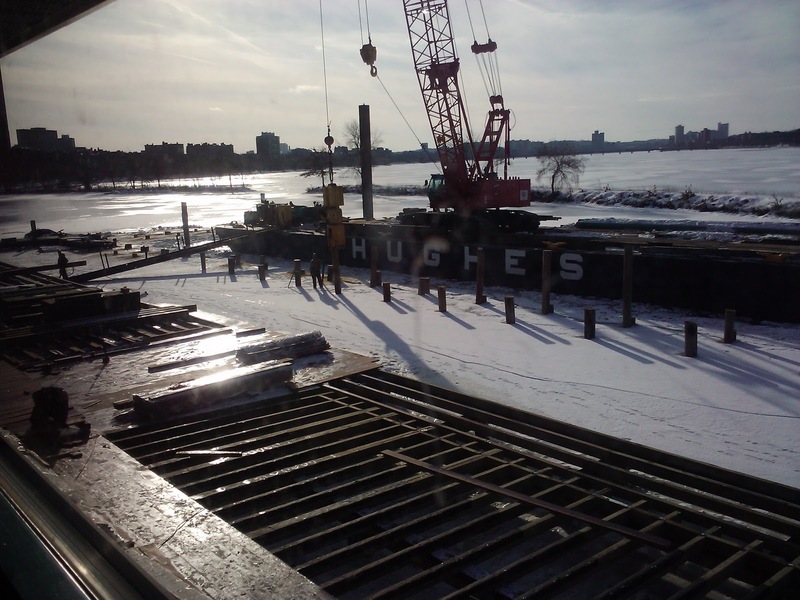 Here are a couple of views of the dock today from our second story window. Every week, CBI Operations Director Tom Moore, Director of Fleet and Facilities Greg Tobey, and I join the weekly construction meeting held by the DCR with Bourne Engineering, and CRC Company. At these meetings every detail of the ongoing construction project is reviewed, audited, and approved. It has been a great experience for me to see how the whole process comes together. I have been singularly impressed with the professionalism, competancy, and efficiency of all parties involved. In so far as folks will agree, I would like to bring attention to the individuals who are building these wonderful dock day in and day out. Today I'd like to introduce Rozeta Nikolova. Rozeta is the Resident Engineer for the DCR on this project. When work is happening on the dock Rozeta is here at CBI. She inspects and reviews every pile, timber, and fastener, insuring that the dock is assembled precisely as designed. 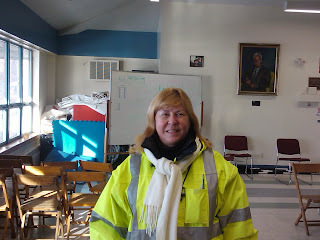 She spends a lot of time with a hard hat on inspecting the work, rain, snow or sunshine. Rozeta is one reason I know this dock will be just simply brilliant. Thank you Rozeta. A lot of rafters are from timber. This is a mini port that can be used to ship smaller cargos. Are you presently surfriding obtaining some form of prices that may can’t hold out till eventually your next pay day progress comes? have you ever ever ever been hooked having Associate in Nursing unforeseen automotive resolve? With reference to the cash advances for you mobile littlest quantity bit unforeseen sharp emergency you’re under-going, a fast day loan will assist you get the cash you may want easily! typically, the entire coaching typically needs just fifteen min's or even manner less. As for me, this website is kinda comfortable for using. I don't understand your troubles cause I don't have the same. Probably, it's a matter of individual perception. Anyway, if you are the person who likes to play friv multiplayer games. The blog or and best that is extremely useful to keep I can share the ideas of the future as this is really what I was looking for, I am very comfortable and pleased to come here. If you like the online games, you can play 300 juegos friv para jugar gratis whenever you want. Thank you!